Affalterbach. 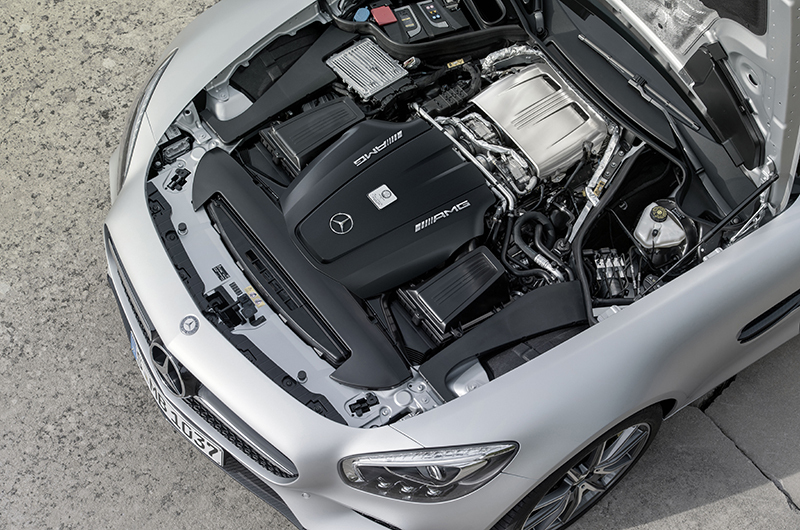 Mercedes-AMG presents a new technological masterpiece: the AMG 4.0-litre V8 biturbo engine is a new development at the sporting heart of the new Mercedes-AMG GT car. This innovative eight-cylinder unit stands out for its sublime power delivery, the purposeful lightweight construction, as well as its high efficiency and environmental compatibility. With peak power of up to 375 kW (510 hp) and maximum torque of up to 650 Nm the new AMG V8 delivers motorsport-inspired performance. The new sports car engine follows in an impressive V8 tradition that started in 1967 with the M100 in the legendary 300 SEL 6.8 AMG racing car and continues with trendsetting features of the future. The new AMG V8 engine has two turbochargers which are not mounted on the outside of the cylinder banks but rather inside the V configuration – experts call it a ‘hot inside V’. The benefits are a compact engine design, an optimum response and low exhaust gas emissions. Dry sump lubrication allows the engine to be installed lower, which moves the centre of gravity closer to the road and forms the basis for high lateral acceleration. The M178 (in-house designation) from AMG is thus the world’s first sports car engine with hot inside V and dry sump lubrication. With a dry weight of 209 kg the new AMG V8 is also the lightest engine in its competitive segment. ‘Spectacle honing’ is another measure to reduce friction and therefore consumption: in this complex process, the cylinder liners receive their mechanical surface treatment when already bolted in place. A jig resembling spectacles is bolted to the crankcase in place of the cylinder head mounted later. Any cylinder warpage that might occur during final assembly is therefore taken into account or eliminated as the cylinder liners are honed. This has advantages in terms of both durability and oil consumption. The new AMG V8 has forged aluminium pistons featuring a lightweight design and high strength. A low-friction piston ring package reduces fuel and oil consumption. Thanks to the use of dry sump lubrication, a conventional oil pan is redundant. Already installed low down, the engine could thus be dropped by a further 55 millimetres. This lowers the vehicle’s centre of gravity, which is ideal for a sports car with extremely high lateral dynamics. In addition to improved agility, dry sump lubrication ensures direct oil extraction from the crankcases for optimal engine lubrication, even at high speeds on bends. Unlike the previously conventional approach, both exhaust gas turbochargers in the new M178 are located inside the ‘hot inside V’ configuration rather than on the outside of the cylinder banks. The advantages of this layout are that the V8 engine is considerably more compact, which enables optimum weight distribution between the front and rear axle, as well as the low installation position. The ‘hot inside V’ also optimises the supply of fresh air to both exhaust gas turbochargers. Electronically controlled blow-off valves ensure a very immediate and direct response. The maximum charge pressure is 1.2 bar; the turbochargers have a maximum speed of 186,000 revolutions per minute. For combustion purposes, 2.3 times more oxygen atoms are pressed into the turbocharged engine as would be the case in a naturally aspirated engine. The two firewall catalytic converters in thin-walled ceramic material positioned down from the exhaust gas turbochargers respond very quickly due to their close-coupled configuration. In conjunction with two metal, underfloor catalytic converters, the M178 delivers effective emission control. Excitement, emotive appeal and recognition value: at Mercedes-AMG engine sound is an important target during development. The new GT has a sports exhaust system with fully variable exhaust flaps. This gives the driver the ability to vary the engine sound: depending on the selected mode they may experience the new AMG V8 with a focus on comfort and relaxed, long-distance journeys or with a more emotive, motorsport-inspired touch. The M178 has its own tonal characteristics which denote the GT’s membership of the AMG family but that also distinguish it from all other high-performance cars. There is an exhaust flap on either side of the rear silencer which is actuated variably on a logic-controlled basis depending on the transmission mode, driver’s power requirement and the engine speed. At low loads and engine rpm the flaps remain closed. This causes the exhaust gases to cover a longer distance and flow through an additional damping element so that the engine sound is pleasantly subdued and irritating frequencies are effectively suppressed. When the driver accelerates, the flaps progressively open so that although some of the exhaust gases cover the longer, acoustically dampened distance, most travel the shorter distance. Under full load at higher engine speeds, both flaps are fully opened, thus allowing the occupants to enjoy the powerful sound typical of an AMG V8. In short, they are left in no doubt as to the performance potential of the 375 kW (510 hp) eight-cylinder biturbo engine. For optimum power output even when outside temperatures are high, Mercedes-AMG uses indirect air/water intercooling. The charge air cooler has a separate, low-temperature water circuit. Due to the optimised throughflow profile for the intercooler, the maximum intake air temperature is 180 degrees Celsius. The low-temperature cooler with its water circuit ensures that the intake air compressed by the turbochargers cools down effectively before it enters the combustion chambers, and maintains a consistently low intake temperature even under full load. A large radiator at the car’s front end ensures controlled cooling of the water circulating in the low-temperature circuit. Extremely short charge-air ducting makes for optimum responsiveness. Auxiliary units efficiently powered by two short, low-friction belts with four grooves. Intelligent positioning of auxiliary units virtually neutralises belt forces on the crankshaft. Two-mass flywheel with centrifugal pendulum prevents torsional vibration on the drive line for a smooth ride. ECO start/stop function and alternator management to save fuel. There are nine high-tech test stations in Affalterbach on which AMG engines with an output exceeding 470 kW and more than 1000 Nm undergo dynamic testing. These test facilities are able to simulate a very wide range of road and environmental conditions to reproduce any conceivable type of operation. Cold or hot starting, mountain passes, stop-and-go traffic or fast laps on the North Loop of the Nürburgring – the engines are required to give their utmost. Even different intake air temperatures and densities can be computer controlled. The AMG 4.0-litre, V8 biturbo engine is being made in Affalterbach according to the “one man, one engine” principle. In the AMG engine shop highly qualified fitters assemble the high-performance engines by hand according to the strictest quality standards. The fitter’s signature on the AMG engine plate attests to this exclusive type of engine production and indicates maximum quality and technology transfer from motorsport – from Formula 1 and the DTM to customer sport activities in the SLS AMG GT3. Powerful eight-cylinder engines are an inseparable part of Mercedes-AMG’s history. Established in 1967, the company caused a stir with the 300 SEL 6.8 AMG which succeeded in taking second place at the 24-hour race in Spa-Francorchamps (Belgium) in 1971 for a class victory. The AMG racing saloon was technically based on the Mercedes-Benz 300 SEL 6.3 with the M100 V8 engine. With an engine output of 184 kW (250 hp) at 4000 rpm and a top speed of 220 km/h, this luxury saloon was Germany’s fastest regular production car at the time. Classic tuning as well as an enlarged displacement from 6330 to 6835 cc resulted in an increase in output to 315 kW (428 hp) at 5500 rpm and in torque from 500 to 608 Nm. Another important engine in the AMG story was the M117, its first eight-cylinder unit with a four-valve-per-cylinder design. With a displacement of 5.6 litres, 265 kW(360 hp) and 510 Nm of torque, this V8 accelerated the 300 CE 5.6 AMG to a top speed of 303 km/h. In 1987 this made the coupé the fastest German car in series production, and American AMG fans reverently christened it “The Hammer”. The supercharged AMG 5.5-litre V8 of 2001 is another milestone in the history of AMG engine development: the M113 K delivered up to 428 kW (582 hp) and 800 Nm of torque. The supercharged AMG 5.5-litre V8 of the SLR McLaren dating from 2003 was even more powerful – the M155 generated up to 478 kW (650 hp) and 820 Nm. 2005 saw the début of the naturally aspirated, high-revving AMG 6.3-litre V8 engine known as the M156, which developed up to 386 kW (525 hp) and 630 Nm depending on the model. Exclusively reserved for the SLS AMG, the likewise 6.3-litre M159 had a maximum output of 420 kW (571 hp) and maximum torque of 650 Nm. In the SLS AMG Coupé Black Series the M159 actually attained 464 kW (631 hp). The AMG 5.5-litre V8 biturbo M157 engine delivers between 386 kW (525 hp) and 430 kW (585 hp) depending on the model, and a maximum torque of between 700 and 900 Nm. M157 is regarded as the most efficient engine in its output and displacement class. With a high specific output of 128 hp/litre and consumption of considerably less than 10 litres/100 km (NEDC combined), the AMG 4.0-litre V8 biturbo engine leads the way in the long tradition of powerful V8 engines from Mercedes-AMG.